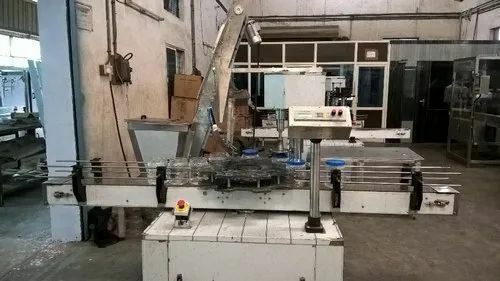 Prominent & Leading Manufacturer from Ahmedabad, we offer plastic cap wad lining machine, automatic capping machine, automatic eight head ropp cap sealing machine, automatic four head aluminium vial cap sealing machine, automatic induction cap sealing machine and automatic linear screw capping machine. 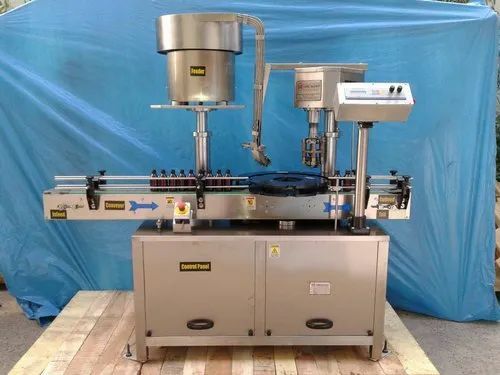 This machine can be disorder caps automatic pour into cap sorting machine by hoister, feed into conveyer belt after automatic sorting, and enter the turntable finally, interval feed into workstation to automatic fill in gasket after positioning the cap by turntable, automatic feed into outlet cap conveyer belt after complete the fill in gasket.Adopt the conveyer positioning mechanism of mechanical drive, steady and reliable when the equipment working, suitable for various specifications of the caps and aluminum foil gaskets. Capping Speed Up to 150-250 Caps / Min. 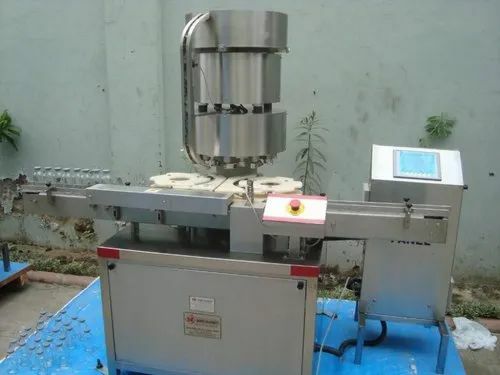 Fully Automatic Four heads and Eight heads ROPP Cap Sealing Machine. 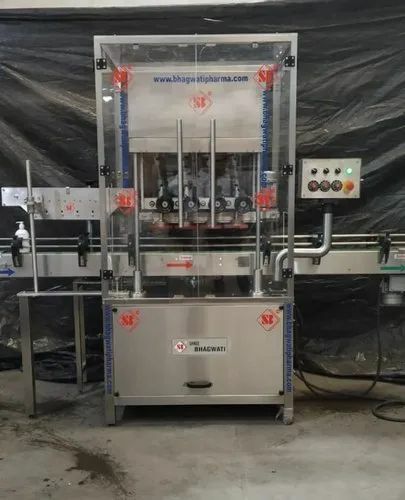 Machines suitable for Liquid or Dry Powder line with output of 150 and 250 Bottles Per Minute. Latest Induction Cap Sealing Technology, to create alternative, airtight, hermetic seals on the necks of containers. The process can produce significant cost savings in the Packaging Process. The seal is strong, flexible & yet easy to remove and provides protection against contamination. Induction heating allows heat sensitive products such as creams, petroleum products, Herbal shampoos etc. which would normally gets spoiled or catch fire on normal heat sealing to be sealed. The sealing takes place without any direct contact which allows full potential of the filling plant to be utilized. 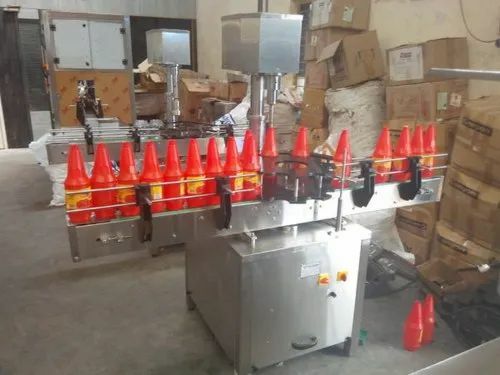 Tamper Proof: It is not possible, from production to the Consumer that the content of the product be manipulated without being clearly noticed. Product Freshness: The taste and aroma of the product remains intact due to the hermetic seal. Maximum Filling Speeds: The sealing takes place without any direct contact which allows full potential of the filling plant to be utilized. Indirect Heating: Induction heating allows heat sensitive products such as creams, petroleum product, Herbal shampoos etc. to be sealed faster and safely than direct heating which would normally spoil or catch fire. IGBT Technology: IGBT’s are more reliable and efficient at higher line speeds. 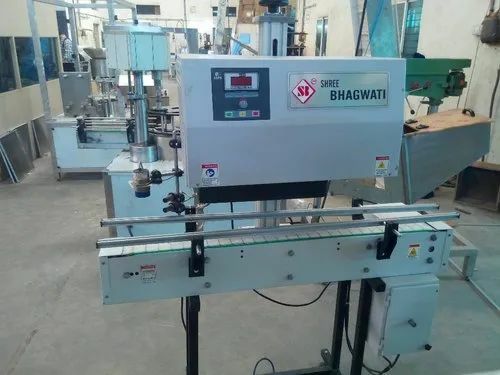 The semi automatic screw capping machine is precision built on sturdy welded steel frame completely enclose in stainless steel sheet and doors are provided to facilitate the servicing of machine. 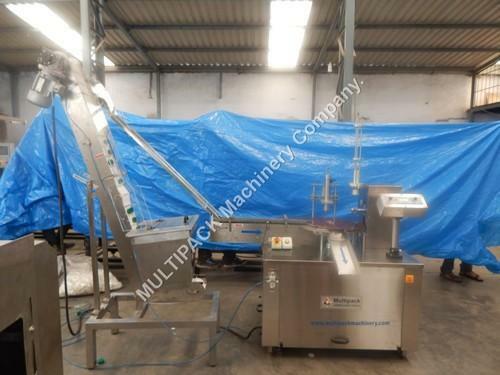 Machine is having motorized rotating head mechanism, which ensures proper cap sealing with uniform torque. Sealing Film.We see a pulp board packing material as the retaining wad, the wax dot pattern layer, the aluminium foil and the sealing film. The lines of force radiate through the foil and induce current flow in it. This increases the temperature of the foil. Due to this, the sealing film melts and adheres to the lip of the container. After the seal is broken, the board or foam packing is retained by the cap. This Consisted of the Control Panel & Induction Head Unit. This System requires water cooling and is available with or without conveyor. The system can seal containers having diameters from 10mm up to 150mm and production speeds up to 200 bottles per minute. Water Circulation System consisting of MS Powder Coated Tank – 20 liters. I/8 Hp water Pump, Flow Switch. Induction Unit consisting of Epoxy Encapsulated Induction Head, Output Transformer unit. Conveyor: Specification: Length: 1.5 meters, width: 6”. Height: 950 mm from Ground Level. SS/ Delran Slat Chain, ¼ Hp DC Motor with control. The system is used for containers having neck size ranging from 10 mm (Dia) to 83 mm (Dia). The maximum line speed is 20 feet/minute. This system requires water cooling. 1.5 HP / 3 phase 380 Volts, 50 Hz. 0.25 HP / 3 phase 380 Volts, 50 Hz. Nitrogen Fussing Nozzles before cap delivery chute. 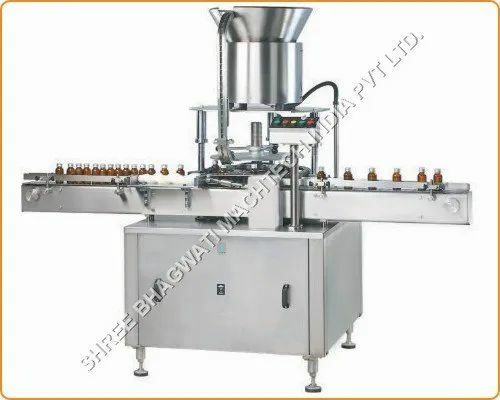 The feed container moving on conveyor belt are feed directly in linear capping unit bringing the container in line with the sealing heads, mean while the bottle pickup a cap from the delivery chute of cap filling bowl, where the body and the neck of the container are positioned in line with rotating head, where the sealing head is performing perfect operation of Torque screwing. (A) Container: Star Wheel, Center guide, Feed Worm. (B) Cap: Die, Delivery chute, bowl. Self-lubricating UHMW- PE guide profile for low friction wears surface, smooth and noiseless conveying. 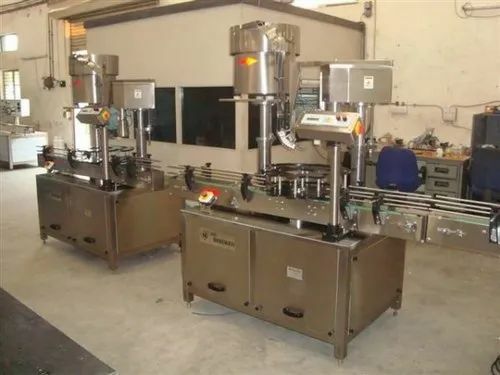 Duly Stoppard Vials are continuously fed from the turntable of filling machine to the flat conveyor belt of sealing machine and move further through in feed worm for correct spacing and transferred to the in feed star wheel. Aluminium caps kept in vibratory bowl automatically orient caps in right direction before entering the delivery chute. Vial during its rotation movement within feed star wheel, its picks up Aluminum seal from the retaining finger of delivery chute and correctly position on the vial before entering sealing turret. Vial now moves on the spring loaded sealing platform, where free spinning sealing rollers moves gradually inside to complete the sealing operation during rotational movement of sealing platform turret. Now sealed vials are transferred to exit star wheel pocket and further moves out on to the flat conveyor belt. 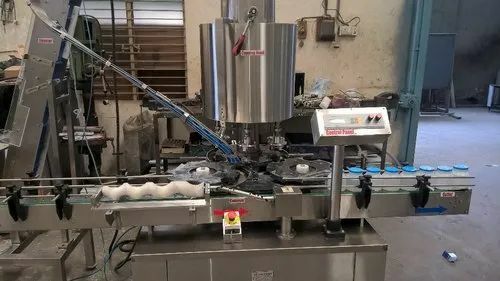 Parts coming in contact with the vial / aluminium cap / flip off exposed to the atmosphere are made out of stainless steel, good housekeeping and good manufacturing practice. 750 mm to 840 mm Adjustable. 50 mm to 210 mm Maximum, Option for other bottle height available. Sealing Pressure can be varied to suit different gauges and sizes of Cap. Looking for “Cap Lining Machine”?